Serial #108298 The magnificent Victorian style case recalls an era in which great pianos were beautiful to behold as well as to play and hear. 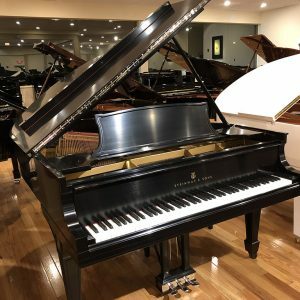 It was rebuilt in our factory with a new Bolduc soundboard, a new Renner action, custom, re-crafted NY Steinway hammers, custom, hand-wound bass strings and our trademark, better-than-new, hand-rubbed satin lacquer finish. And it was prepped to the highest concert standard by our superb, Faust Harrison touch and tone masters.